The Pardo 50 is perfect for those who love spending time with their family and guests on board as well as for those who want to relax in a less crowded atmosphere. For this reason, one of the main characteristics of the deck is the walk-around, developed on a unique surface, from bow to stern. The high freeboard provide greater safety when having children or guests on board. Among the optional features, there is also the possibility to install a movable platform, which is perfect, as used on the superyachts, in order to have an easier access to sea. 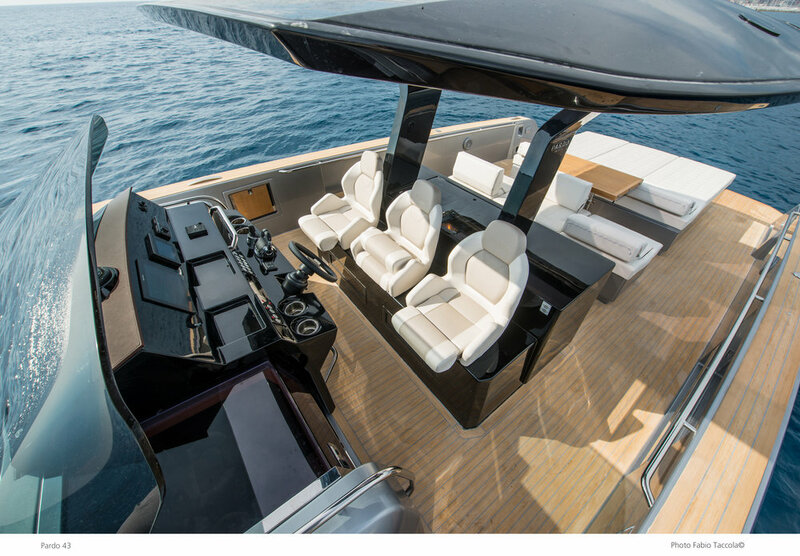 The aft of the boat can enhance the fun and the relax at sea: their movable side sections can be transformed into two platforms – looking like two roofs on the sea. Thanks to that, the cockpit area can be wider. The flooring is made of natural teak - provided as standard. Upon request, it can be replaced with synthetic teak. The cushions colours and upholstery can be fully customised by the owner. The relax areas are set in the front, where you can find a sunbathing area, and at stern, where you can find a wide sunbathing bed with a storage area underneath. That can be set up as a tender garage as well where a Williams 285 can be stored. The main characteristic of the exteriors is the kitchen. Two different layouts are possible: a standard kitchen placed in the way of the length along to the entrance under the deck or a wider kitchen with a work top and side way to the cabins. The 16-square meter fixed T-top is made of a rigid and light carbon fibre and it goes from the cockpit to the dining area. The covering can be extended to the stern with a bimini that can be installed with an electrical mechanism integrated to the upper part of the T-top or with a manual system with poles. In the night, an external lighting system is provided to enjoy the romantic atmosphere in the whole cockpit area. The Pardo 50 is a perfect compromise between performance and comfort. Its V-shaped hull has a variable geometry: 16° at stern and more than 50° in the forward section. This guarantees a great seakeeping and at the same time a good manoeuvrability to plane in safe and fast conditions. The convex bottoms ensure a greater shape stability. From a structural point of view, another strong point by Cantiere del Pardo is a particular technique consisting of a vinyl resin infused hull as a monolithic structure with the keel; the side and the deck are made in high-density PVC sandwich for thermal and acoustic insulation. The engines are moved more ahead, to have a better centre of gravity and greater stability. The standard version comes with 2 Volvo IPS 600 engines (700 or 800 are optional). The electronic wheelhouse has a joystick for the manoeuvres and electronic thrust levers. Such installation of the engines avoids the bow from rising up. Moreover, it eases and accelerates the initial phase of the plane, ensuring a good and constant seakeeping even at the highest speeds. The interiors, with great heights, are the core of the shipyard’s DNA: a timeless elegance tailor made by the hands of expert artisans. The lines and the refined furniture are enhanced by the accurate choice of woods and the attention to details that make the Pardo 50 a real excellence of the Made in Italy. The volumes of the owner cabin are significant: there is a double bed with a storage under the mattress, a full height wardrobe and a head with separated shower box, along with several storage areas. In the guest cabin you can find many lockers and drawers, two single beds and a head with an integrated shower. Two entrances are provided: one from the cabin and one from the corridor to be used as day head. All the colors and materials can be customized according to the owner’s wishes. 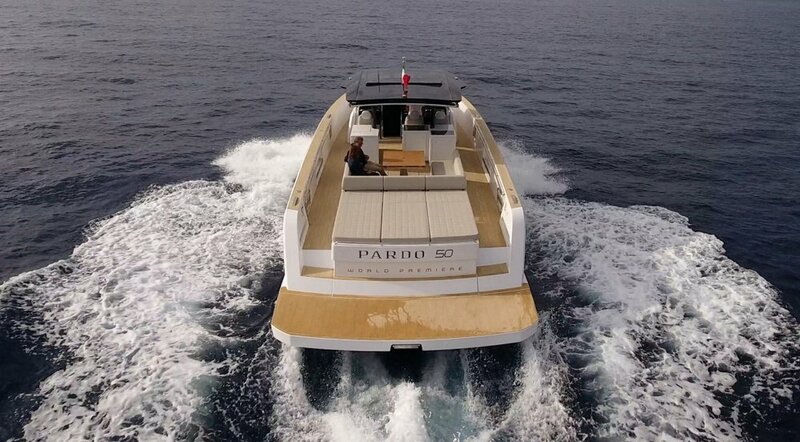 Pardo 50 is a real unique icon in this powerboat segment. 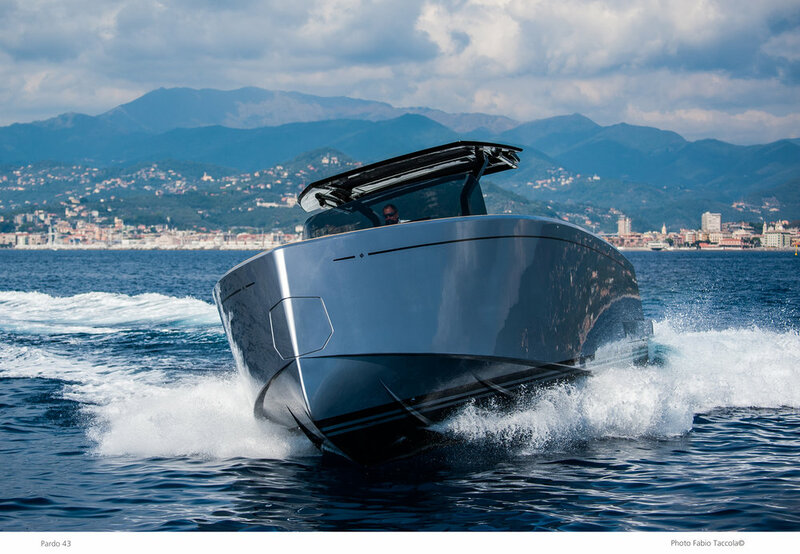 The advanced technologies on board are associated to the design, elegance, quality and the possibility of customizing – features belonging to Cantiere del Pardo’s DNA. Its large hull volume and ample headroom make the PARDO 43 interiors warm, welcoming and spacious. 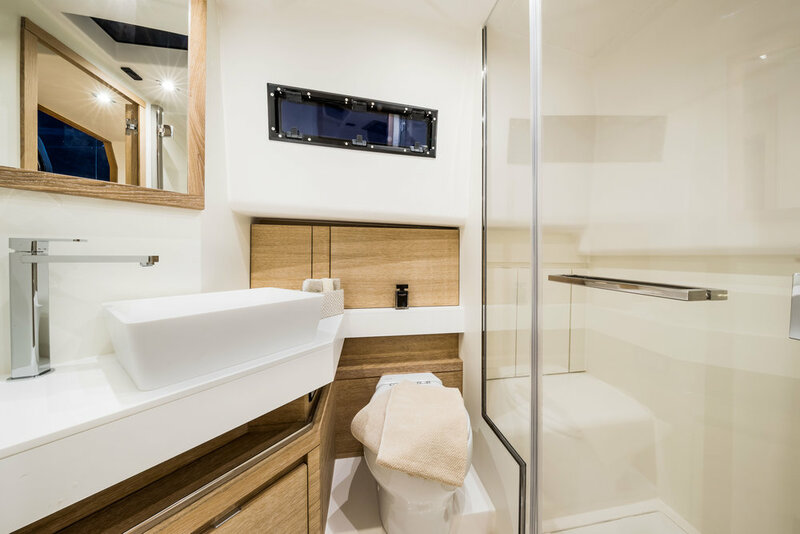 The open space is made up of two large cabins; the owner’s cabin at the bow includes a generous bed, many storage areas, large closets and plenty of natural light. Aft, a wide storage area can be turned into a secondary cabin with two twin beds, closets and many storage areas. The passage between the two cabins is excellent. The head is located between the cabins and offers a separate spacious shower stall. The interior colors and materials can be fully customized. Pardo Yachts unique personality is the result of both our boatbuilder’s expert hands and a unique design that showcases craftsmanship, even in the most modern shapes. Thanks to its linear and refined furnishings, the interiors reflect the excellence synonymous with Made in Italy, characterized by a careful choice of wood veneers and meticulous workmanship. 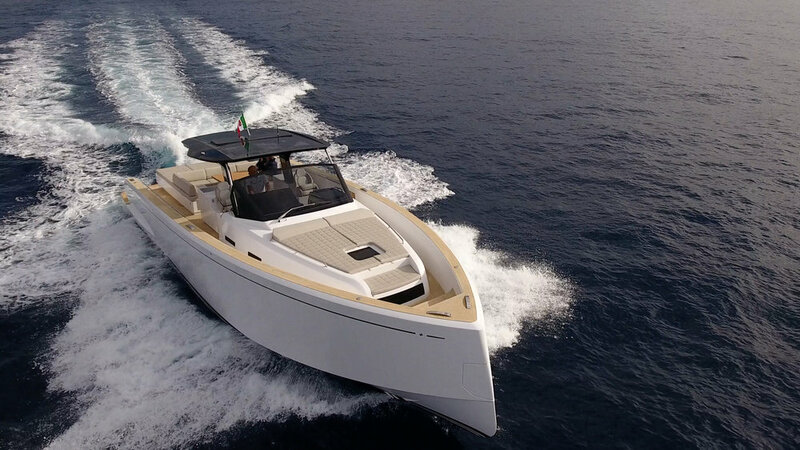 The new Pardo 38 is the third and youngest model in the Pardo Yachts range. It will be available with two engine propulsion systems Stern Drive or Outboard allowing for speeds of up to 50 knots. The walk-around one level deck plan taken up from two elder sisters provides safety and easy movement on board. As for every Pardo Yachts model, particular attention has been dedicated to its unique design, details and quality of the materials. Interior layout will be available in two versions. Standard version will include one cabin with a double bed and a head. Optional version will provide additional two singled beds in the aft area.